This is part three in the MaRS Smart Transportation Market Insights, part of the Connected World Market Insights series. The future of transportation is here today. But to ensure that Canada’s and Ontario’s automotive sector remains competitive (or regains its competitive position), the sector players need to up their game. General auto sales are on the rise in Canada and the US, and have been on the rise for some time. According to the Wall Street Journal Market Data Center, 1,281,313 light vehicle units were sold in the US market in October 2014 alone (and 1,455,516 light vehicle units were sold in October 2015)! By comparison, Frost & Sullivan (2015) data show that, globally, 304,953 electric vehicles (EVs) were sold in 2014, and projects sales to reach 2,337,748 units by 2020. See Figure 1 for the top 10 EV manufacturers in units sold. Electric vehicle sales are on the rise, yet remain a small percentage of cars sold (see Figure 2). However, automotive manufacturers (OEMs) are taking EVs more seriously. Just recently, in the aftermath of their huge diesel emissions scandal, Volkswagen slashed their projected spending for 2016 by one billion Euros, while increasing the portion of their investment in alternative drivetrain vehicles. There are three main types of vehicles that can be classified as EV: battery electric vehicles (BEVs) that run purely on electricity, hybrids (HEVs) and plug-in hybrids (PHEVs)—the latter two combine electrical and internal combustion engines. In Canada, many different EV models are now available to consumers. There is no perfect transportation solution. Even EVs have concerns, such as the higher upfront cost for consumers, variances in battery life and range anxiety (along with the lack of available charging stations). Key EV advantages (particularly BEVs) include reduced greenhouse gas emissions (by 67-95% per vehicle per year for Ontario, but this depends on how the electricity used to power the vehicle was generated in other jurisdictions), cheaper energy costs to run (BEV energy costs are estimated to be three to five times lower than internal combustion engine vehicles) and lower overall maintenance. In the US, the Corporate Average Fuel Efficiency (CAFE) standards include a fuel efficiency target of 54.5 mpg by 2025. Canada has imported this policy. Harmonization puts Canada’s automotive sector on equal footing with the US market, which is especially critical because Ontario has been manufacturing 16% of the vehicles for the North American market since 2010. On November 24, 2015, the Ontario government released its climate change strategy. Of key interest to the transportation sector is the goal to reduce transportation emissions by promoting the uptake of zero emission and plug-in hybrid vehicles. The government also plans on introducing climate legislation that establishes a long-term framework for climate action. This legislation, if passed, would make Ontario’s cap and trade program law, and will act as a positive market driver for the Cleantech and automotive sectors. Local governments can also set rules that can act as market drivers. For example, gasoline-fuelled cars could soon come under a new threat—climate change warning signs at the pump. The City of North Vancouver recently passed a bylaw imposing this requirement. The prices of oil and gas (and, subsequently, gasoline prices) fell drastically at the beginning of 2014 and remain relatively low today. Not all consumers have the planet in mind when they make purchasing decisions (not to mention having a rather short-term outlook). One can assume that with lower gas prices, consumers will give less thought to efficiency, which will consequently affect their vehicle purchasing decisions. So, have low gas prices impacted EV sales? Bloomberg New Energy Finance (BNEF) data show a correlation between lower gas prices and lower sales of BEVs and PHEVs (see Figure 4). However, low gas prices are not likely here to stay. Weaker than expected demand and a supply glut have suppressed oil prices, but these factors are in flux; upcoming carbon prices will also affect oil prices once introduced more broadly. Also, at this stage, many EV owners are early adopters, and their purchasing decisions are arguably driven more by cool technology, brand mission (buying as much into the brand as the item itself) and environmental benefits than by pump price. According to CB Insights, there have been major investments in auto tech over the past five years. CB Insights defines auto tech as “companies that use software to improve the safety and efficiency in cars, specifically looking at assisted driving/autonomous software; driver safety tools; driving data/connected car; fleet telematics; vehicle-to-vehicle communication; and auto cybersecurity.” See Figure 5 for deal numbers and dollar value of auto tech investments. Electric car investments, on the other hand, are not faring as well as software-based auto tech investments. Over the last two years, the average deal size for the EV investment category was around $7M (see Figure 6). It will be interesting to see the impact of climate change policy (such as the strategy Ontario just announced, along with the COP21 outcomes), and the imposition of carbon pricing in particular, on both the autotech and EV sectors from an investment perspective. Internal combustion engine (ICE) efficiency innovations from major OEMs pose a moving target for electric and fuel cell vehicle drivetrains, according to Lux Research. “The internal combustion engine currently reigns supreme, and manufacturers continue to work to extract every ounce of efficiency from it.” Internal combustion engine vehicles remain the true competitor to EV technology adoption. Elon Musk even went so far as to release Tesla’s patents, in recognition of this barrier to EV growth. Groups such as Plug’n Drive are actively seeking to enhance the role of EVs in Canada by raising public awareness about EVs and charging infrastructure. They are also participating in and developing research aimed at driving greater adoption of EVs across Canada. So how does a traditional automotive OEM function to bring new technology to market? Hydrogen versus electric or hydrogen + electric? There are many ways to generate hydrogen. It can be captured from manure, it can be derived from tree bark and it can be sourced from excess electricity. For example, Quebec generates a lot of hydropower, and sells its excess hydropower in bulk to the US market (and Ontario). “If excess power is stored in the form of hydrogen, then this hydrogen can be used to propel vehicles,” said Tanguay. Ontario startup Hydrogenics is currently storing hydrogen derived from its electrolyzer technology. It uses excess electricity from wind generators to apply an electric current across water to separate water molecules into their component oxygen and hydrogen atoms, and then captures the hydrogen. They are now storing this hydrogen in the natural gas network with Enbridge in Ontario and E.ON in Germany. More recently, Hydrogenics has signed separate supply agreements with several Chinese electric vehicle integrators to bring its fuel cell and fuelling station technology to China (see Figure 7). Hydrogen has a future in our transportation sector. There is also a key opportunity for hydrogen to knit together our power and natural gas grids, enabling greater integration of renewable resources into both these energy networks. Battery prices are coming down. According to the Deutsche Bank report “Crossing the Chasm,” energy storage companies are expected to significantly reduce energy storage costs by 20–30% per year over the next five years. The report states that this “could bring conventional lithium ion batteries at commercial/utility scale to the point of mass adoption potential before 2020.” It also stated that incremental storage costs will likely decrease from about $0.14 per kilowatt-hour to $0.02 per kilowatt-hour within the next five years (see Figure 8). Batteries currently comprise a significant percentage of an EV’s cost. Any improvements in battery efficiency and reductions in battery size will help to significantly reduce overall EV cost. With the high cost of EV ownership as a major deterrent, reducing this cost will help to entice consumers to switch from ICE to electric vehicles and encourage the car-less to consider EV ownership. Innovation goes beyond battery or fuel cell technology and infrastructure focus. Efficiency can be greatly improved by adopting technologies that improve power conversion. For example, improving power conversion can reduce battery size requirements. A transmission is part of the drivetrain. An EV’s powertrain starts with the batteries. Batteries power the motor, which traditionally powers the wheels directly through a reduction gear and axles. However, replacing a simple reduction gear with a transmission between the wheels allows the motor to operate more efficiently. With a motor operating more efficiently, you draw less on your batteries, which improves range. Much has been reported on the status of innovation in the refuelling or recharging infrastructure for alternatively powered vehicles. The Canadian Automobile Association (CAA) & ChargeHub have developed a map of publicly accessible charge stations across Canada. There is an infrastructure deficit for hydrogen car fuelling and, to a lesser extent, EVs. Super chargers are not found on every corner like gas stations, but charging options are plentiful when you account for the residential sector. Electricity is everywhere, at least in key automotive markets. Hydrogen facilities, on the other hand, have some catching up to do. There are two key electric charge station segments: residential—which will likely become a commodity market at some point—and the commercial sector, where business models are still being explored. With the growing number of electric vehicles and connected cars, the rise of renewable energy, energy decentralization trends, and the fusion of energy and IT, new players continue to arrive on the scene. This is leading to a growing battle between traditional utilities and automotive companies and the next generation of automotive companies and utilities. This is where it gets complicated. There are now car sharing market players like Uber, Lyft and Split (more on the impact of the rise of the sharing economy on the automotive sector in Paul Barter’s December blog) and they are doing well. With the next generation caring more about mobility services than owning an asset, car companies will have to revisit their business models. The sharing economy could have a significant impact because car ownership isn’t what it used to be, at least in North America. To previous generations, owning a car was a big deal. While services like Uber are disrupting the automotive sector, new automotive market players like Tesla are entering the utility space. Cars, as well as electric vehicle charging stations, are becoming part of the Internet of Things (IoT). Like cars, charge stations are becoming connected and controlled, which enables them to participate in broader demand management programs, a trend across the rising energy Internet. 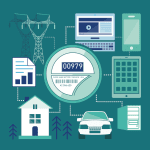 See our Connected World Series paper, “The Evolving Digital Utility: The convergence of energy and IT,” for more on the energy Internet. Electric vehicles stand to become a significant demand management opportunity. At the other end of that scale, if utilities are not ready, and consumers all plug in their cars when they get home at 6:00 PM, these EVs could overload a transformer and the local distribution grid. One way to charge EVs is to turn to smart charging, which avoids spikes or peaks in power demand. Forward-looking smart charging would enable the use of EV batteries as storage for the utility’s valuable grid services, while also allowing for greater renewable energy integration. For more on smart charging, see this EUROELECTRIC paper. There are several key challenges for the EV charging infrastructure at the commercial level. For example, chargers must be compatible with different EV models and manufacturers, and consumers will have to avoid dealing with proprietary payment options and multiple payment systems. According to Lux Research, all automakers are ramping up development efforts for EVs, and many automakers have plans for connected and autonomous cars. Some automakers are beginning to combine these two development streams. Autonomous features, a cross-over tech from the connected car, could add significant savings for EVs by extending range. The future of transportation is connected, alternatively powered and automated. I doubt that there will be a one-size-fits-all solution. What works for an urban area might not work for a rural area. For example, Uber-type business models might not be as prevalent as carpooling options, and the personal automobile might not be going anywhere anytime soon given our recent history with suburban sprawl and its reverberating impacts. Our automobile might become truly automatic over time, and will increasingly shift toward alternative power sources. This series is a collaborative effort from members of MaRS Market Intelligence: Joe Lee, Emily Nicoll, Lynda O’Malley and Jovana Stranatic.